What options do I have if the environment in which this runs doesn't allow a remote IDA Pro instance to connect to gdbserver? In short: the environment you have is limited in what it allows you to do, but you do have trusty old gdb and a binary to reverse engineer. I am trimming the output of GDB for brevity since it usually shows the copyright and other information at the beginning of ever session. When I reproduce the output I'll start at the first (gdb) prompt line, or in case or auto-executed commands from the first genuine output line. In order to distinguish commands entered at the GDB prompt, these will have a leading (gdb) just like in the real world. For shell command this will either be no prefix at all or $ as it appears to be the convention on most unixoid systems. This section is about setting up your gdb environment and starting the process. I'll also include a few tidbits for the complete newcomers. GDB has a nice prompt at which your cursor will stop after the program breaks or whenever you are stepping or some such. Pressing RETURN (aka ENTER) after you ran a GDB command will run the same command again. This is useful when you are stepping through code with step or next and simply want to continue one by one. You can call actual library functions or even functions from within the debugged program using the command call. This means you can try out behavior or force behavior. 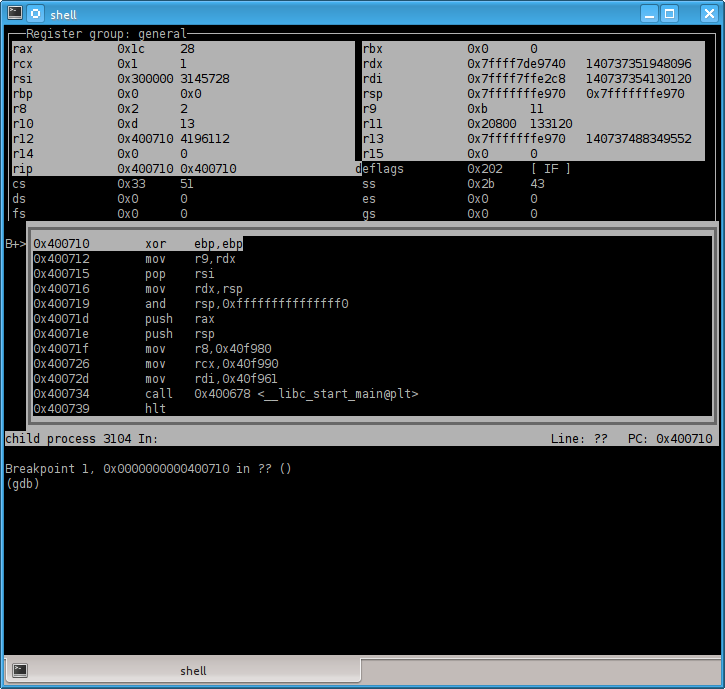 You can start GDB with gdbtui or gdb -tui to get a - supposedly more convenient - more visual text user interface. It shows the source code at the top and the (gdb) prompt below. You can also switch to this layout by executing the command layout src at the (gdb) prompt. GDB has a command line completion feature much like many shells, so use Tab to your advantage and also make sure to use help or help [keyword|command] whenever you are in need of help. shell allows you to execute commands in the shell, so that you can run commands from within your GDB session. During development an example would be shell make. print, examine and display know various formats (/FMT) which you can use to make the output more readable. When source-level debugging you can use C type casts to display values. Imagine a C string behind a void * (which GDB knows thanks to the symbols in such case). Simply cast to (char*) and print it: print (char*)variable. Since we want to dynamically analyze the binary, we need to start it first. Easy enough. From the (gdb) prompt you can then issue the run command (shorthand r) to run ./exe with the parameters given on the command line. I prefer this method, but your mileage may vary. btw: if you were wondering about environment variables, use GDB's built-in help command as help set and help show. Pointers: set environment VARNAME=VALUE and show environment [VARNAME] and unset environment VARNAME. 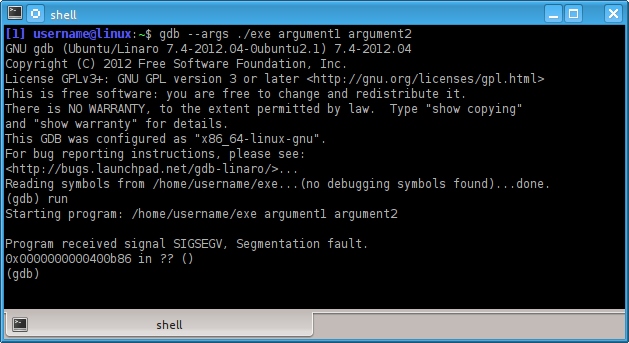 Phew, but why does the program stop with a SIGSEGV (segment fault)? Well, we don't know yet, but it looks like this little beasty wants the proper treatment. Since we practice defensive computing, we don't want to run anything we don't know much about, right? So let's start over. If this would have been malware we'd have to flush the machine and reinstall or restore a snapshot if it's a VM guest. alright, so we can set a break point on that one and then run the process with the arguments we fancy. But wait, this is getting tedious already. No easy method to automate these steps in some way? As a matter of fact there is. 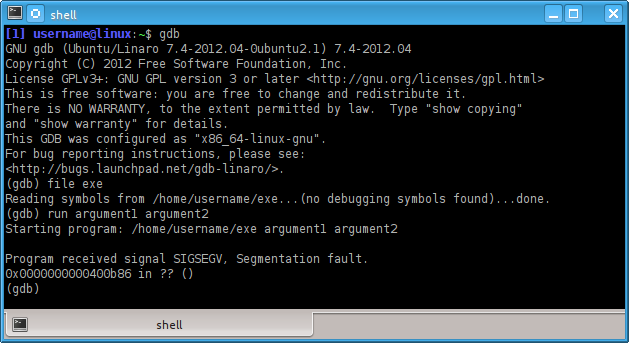 A file named .gdbinit can be used to issue commands to GDB upon startup. 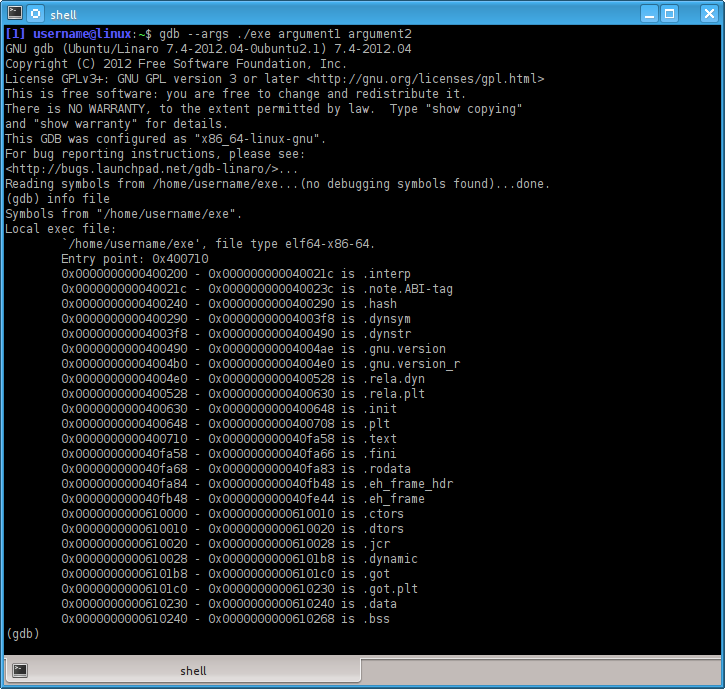 You can also pass a file with GDB commands using the -x argument on the (shell) command line. If I have a number of projects, usually they are in subfolders with a .gdbinit file each. Side-note: -nx prevents the .gdbinit contents from being executed upon startup. which will also show you the contents of the registers in an overview. Sweet. So we can see the disassembly while we step through the code. We could conclude this here, but of course there are more tricks to be learned, so why not go a little further. NOTE: the registers with white/gray background show that a value has changed. Not too meaningful when we just started the program, but mighty useful when stepping through code later on. or shorter disp/i $pc where /i is the format, you can remember it best by thinking "instruction" and $pc being the instruction pointer, also known as program counter - hence pc. The call leads us to a function which calls ptrace(PTRACE_TRACEME, ...), now why would it do that? But how do we get around it? We'd have to overwrite the call to the function which calls ptrace() with nop or something along those lines. The 0xe8 is a call instruction and we know now that it is 5 bytes long. So let's nop this out. (x/10b $pc means examine 10 bytes at program counter - default format is hex already). Excellent. We can now execute it. # if we havnt, this will cause the routine to exit. printf "Instructions will be written to stdout.\n"
printf "Type instructions, one per line.\n"
printf "End with a line saying just \"end\".\n"
Type a line containing "end" to indicate the end. If an address is specified, insert instructions at that address. If no address is specified, assembled instructions are printed to stdout. Use the pseudo instruction "org ADDR" to set the base address. Again the above script snippet wasn't written by me, but by Tavis Ormandy - see the link above. This concludes this little Q&A. Not the answer you're looking for? Browse other questions tagged tools dynamic-analysis linux debuggers gdb or ask your own question. How to stop debugger right after the execution? How to perform SIGTRAP emulation with GDB? How to assemble and inject an instruction with GDB?